Artemis was Apollo's twin sister and daughter of Zeus and Leto; she was the equivalent of Diana, the Greek goddess of the moon, the woods, and the wild, who, the legend states, derived so much good from certain plants that all such plants were named Artemisia for her. Intermountain Flora presents another etymology: the genus is named for Artemisia, historical Queen of Caria (in present day Turkey) who was a "noted botanist, medical researcher, and scholar". She was named for the Greek god. 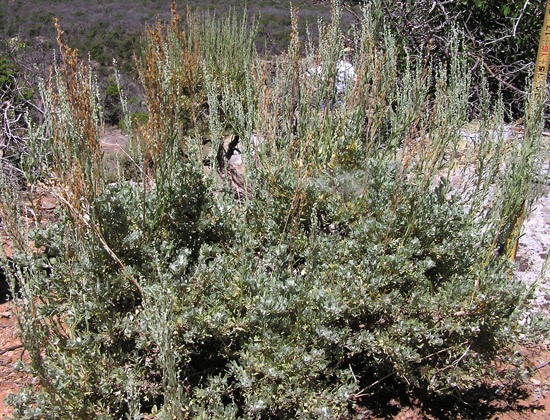 In his Colorado Flora, William Weber separates Seriphidium from Artemisia on the basis of ray flowers: Artemisia has small ray flowers; Seriphidium has no ray flowers. Weber indicates that "chemically and morphologically" Artemisia and Seriphidium are "distinct". Few other botanists accept this distinction and they classify all the plants as Artemisia. "Seriphos" is Greek for "wormwood", the common name often applied to a number of Sage plants. Near Hovenweep National Monument, March 20, 2015. Second photograph: Artemisia nova with a few taller, silvery Artemisia tridentata. Far Western San Juan National Forest. June 3, 2015. Navajo Reservation above Teec Nos Pos, Arizona, June 24, 2006. A close look at Artemisia nova shows it to be yellow-green, but as the third photograph at left shows, from a distance the plant has a definite black cast to it. Artemisia nova grows in tight rounded clumps and produces numerous flower stems projecting from the top. 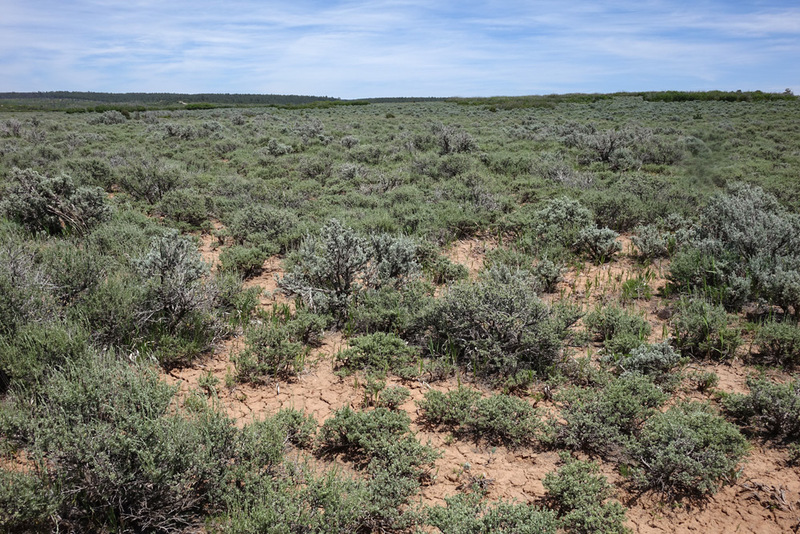 Artemisia nova is commonly mistaken for a small Artemisia tridentata (shown below) but Artemisia nova grows to only two feet tall and wide whereas Artemisia tridentata grows to 7 feet tall and wide. A. nova has leaves usually far less than an inch long; A. tridentata leaves are usually far more than an inch long. A. nova overall is usually neatly rounded in a cohesive mass; A. tridentata is usually messy, sprawling, and twisting in an open, airy form. Although most botanical texts indicate that A. nova and A. tridentata are sometimes difficult to separate, I find it relatively easy to separate these two but much much more difficult to separate A. nova from A. bigelovii. Click to see A. bigelovii and to read about how it differs from A. nova. 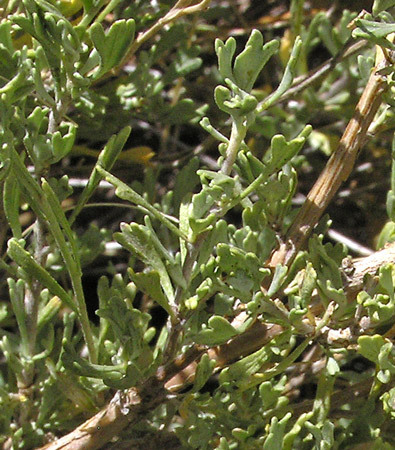 Aven Nelson collected Artemisia nova in the late 1800s in Medicine Bow, Wyoming and named it Artemisia nova in 1900. William Weber considers this, A. tridentata (see below), and several other species not to be true Artemisias and he places them in the genus Seriphidium. Latin gives us the specific epithet "nova" for "new". 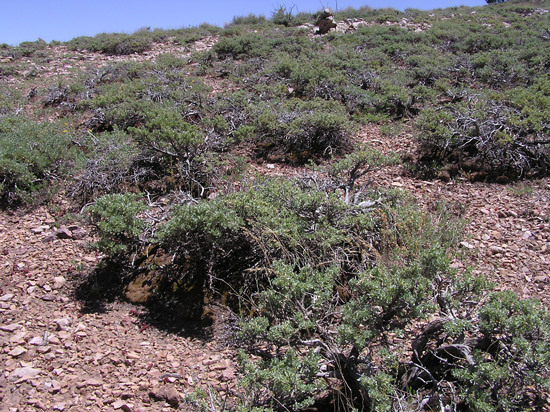 Artemisia nova likes thin, rocky soils in the foothills to about 8,000 feet. It often occurs in great numbers, as the photographs at left and at the top of the page show. This growth pattern is quite reminiscent of the widespread Coleogyne ramosissima that dominates nearby Utah Canyon Country. Semi-desert, foothills, montane. Shrublands. Fall. Road into Canyonlands National Park, Utah, May 19, 2004. 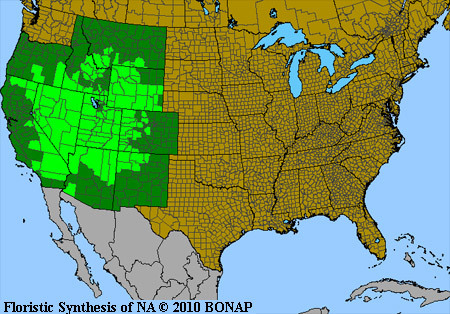 Sagebrush is the most famous of all Western plants; it is "The West". 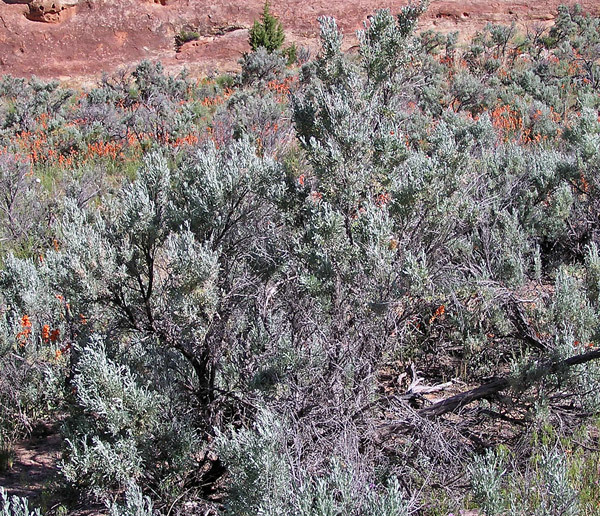 It dominates vast areas of the foothills, low canyons, and high deserts providing shelter for numerous animals and for flora, such as the red Paintbrush shown at left, that prefer shade and parasitize the roots of Sagebrush. Artemisia tridentata grows to 9 feet tall and 6 feet wide in a raggedy pattern of fallen limbs, dead branches, and lovely blue-green leaves topped by tight clusters of numerous flowers in the fall or thin, dead seed stalks the rest of the year. 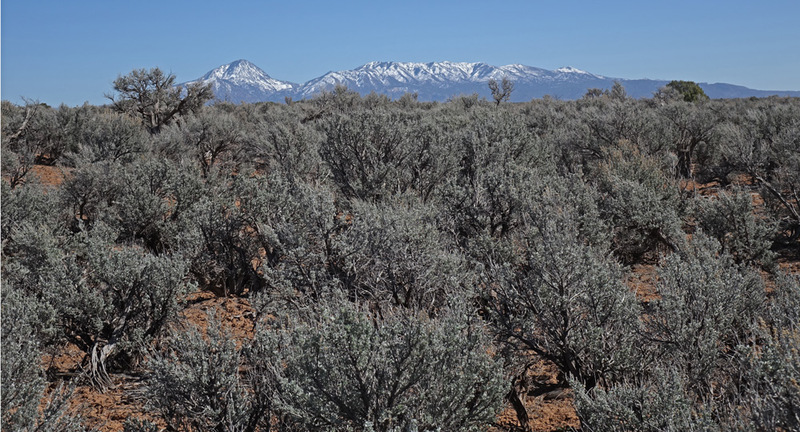 Just brush against Sagebrush and you will release a magnificent redolence calling up all the allure of the West. A walk through Sagebrush country leaves one's clothes smelling of big spaces and clear skies. Summer rains striking Sagebrush fill the air with unforgettable pleasant sweetness. Thomas Nuttall collected the first specimen of this plant for science in present-day Oregon on his trip with the Wyeth Expedition of 1834-1837 and in 1841 he named the plant Artemisia tridentata. 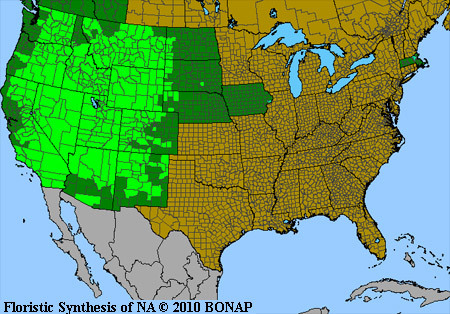 It is puzzling why Nuttall's type specimen of this plant was collected in Oregon since he had walked and ridden horseback through miles of this plant as he crossed through present day Nebraska, South Dakota, Wyoming, etc. Perhaps Nuttall saw how common the plant was and decided not to lug it with him and only collect it at the end of his journey. Perhaps. William Weber renamed the plant Seriphidium tridentatum in 1984. "Seriphidium" is from the Greek for "wormwood". Few, if any other botanists accept Seriphidium. Grandstaff Canyon, Utah, April 13, 2005. 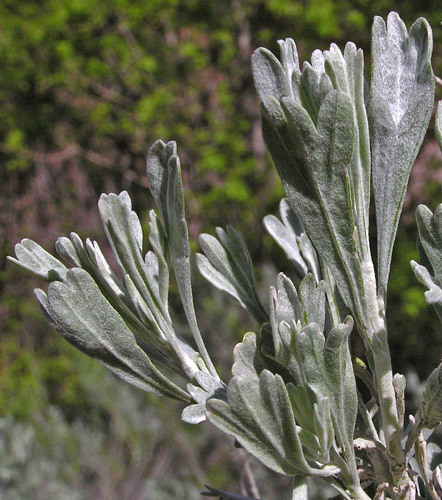 Leaves appear "sage-green" because they are covered with a myriad of fine, white hairs. Nuttall gave the specific epithet, "tridentata", because of the very prominent three indentations at the tip of many leaves. Near Yellow Jacket Canyon, September 20, 2005. 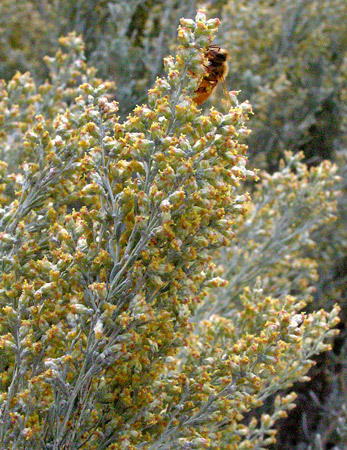 In September, Sagebrush has numerous ten inch long stalks of tiny yellow flowers at the end of its leafy branches. These flowers provide sweetness for bees but also, unfortunately, provide pollen that causes some folks to sneeze and weep. Near Yellow Jacket Canyon, January 8, 2008. 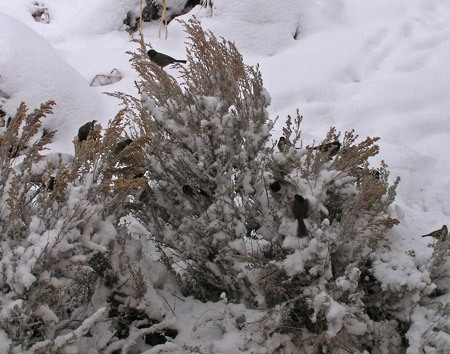 This is the same Sagebrush plant as above; now the visitors are Juncos nibbling seeds in the snow, not bees seeking sweetness in the fall.